I wish we were able to go to the movies to see films when they are on the big screen. The reality is that we can not afford to do this too often given the price of a movie experience. Of course, this does not stop us from having a family movie night. We are able to make our own Whirly Pop Popcorn, curl up on the couch, and watch a rented DVD. It’s all about family time. Now thanks to a Global Influence campaign (see my disclosure below), I have some fun news to share with you. 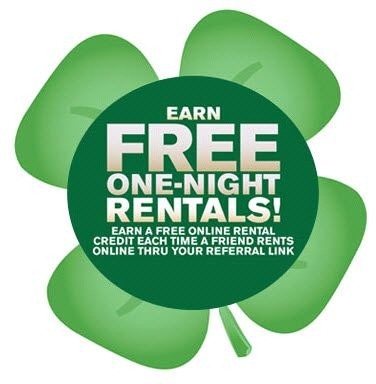 From today to St. Patrick’s Day (Thursday, March 17th), Redbox is giving everyone a chance to receive as many free one night movie rentals as you can. What’s the catch? Nothing more than telling your friends and family via spreading the word about the fun. Redbox will e-mail you a unique web address for your referrals. Each time someone reserves a movie online through your unique web address, you will get a credit for a one-night DVD rental FREE. If your friend has never reserved a Redbox DVD online before, they will also receive a credit for a free one-night rental. Please note that rental credits are valid for 10 days after they are deposited into your account. This means you can have quite a nice movie filled March. So what are you waiting for? Head on over to score some free movie nights with your family and friends. Then spread the lucky news by e-mailing it, posting to Facebook, and sending Tweets to everyone you know. Disclosure: This is a sponsored post from Global Influence and Redbox. For sharing this information, I will be receiving compensation.